A famous area of remarkable red sandstone cliffs and canyons, spires and arches, with a wide range of outstanding walks. The two key areas are The Island in the Sky, with its truly iconic views, and the dramatic, crazed Needles. 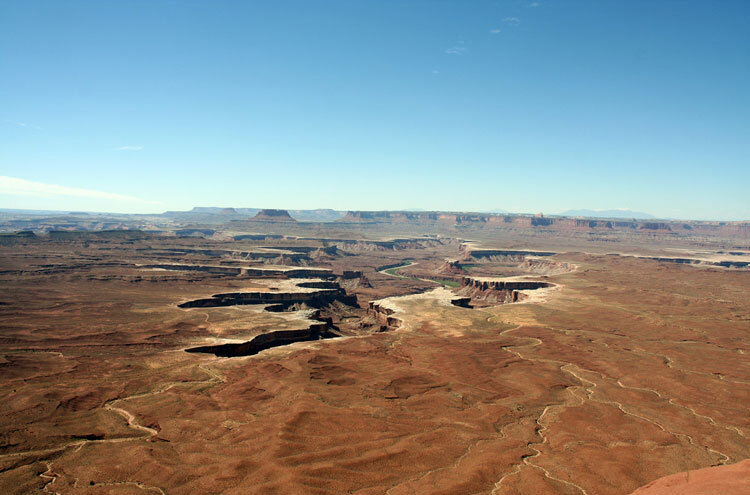 Canyonlands lies at the junction of the Colorado and Green rivers, which, over millions of years, have carved a huge area of superb red sandstone mesas, buttes, canyons, spires and arches. 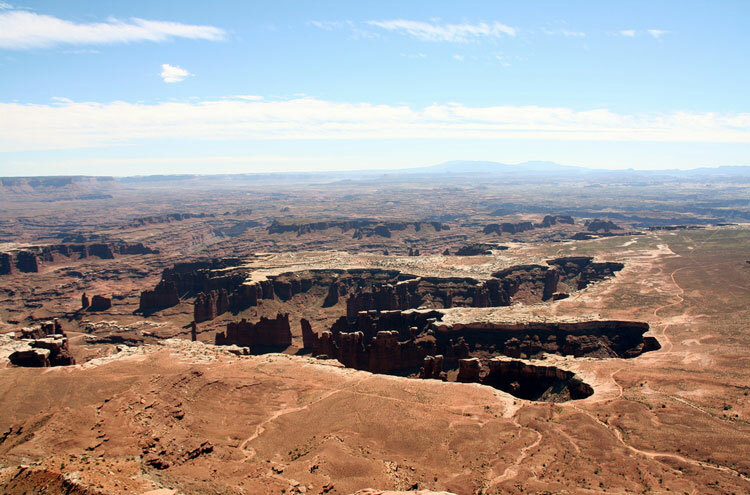 What makes Canyonlands so outstanding – in Walkopedia’s eyes, anyway – is the way that different layers of rock have interacted with the great forces of erosion to produce a series of flat plateaux and cliffs – the long, narrow platform of the Island in the Sky and other mesas at the top of the heavenly ladder, with their hard pale topping; the wide mid-level table of the White Rim all around it, again protected by harder pale rock from erosion – but each eaten away at the sides by the gnawing at their softer bases as the great rivers and their side streams do their destructive work. This has resulted in all sorts of special beauties. The distances are huge: you can see for miles from the Island in the Sky in the clear desert air, gazing across the abyss to the far canyon sides and distant mountains. 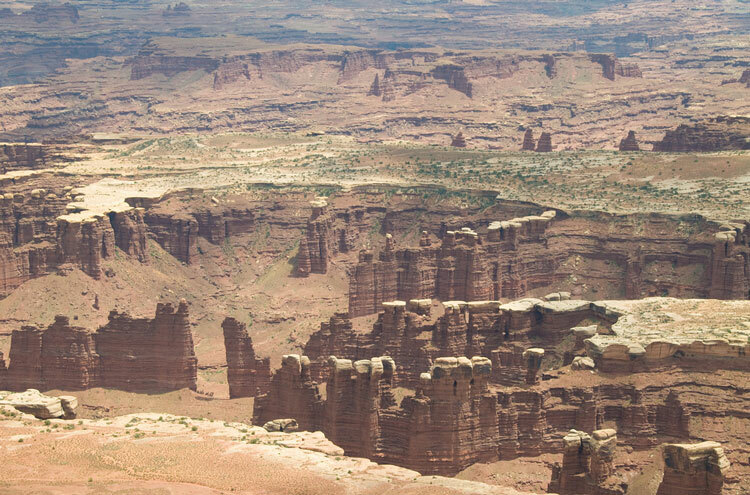 Immediately below, the White Rim table land is eaten into beautiful shapes, curves and arabesques worthy of Matisse, by the encroaching lower canyons, breaking up at its edge into some stunning white-topped buttes and spires. Further away are the broken jumbles of the Maze and the Needles. And in the north is the other-worldly weirdness of the Upheaval Dome. 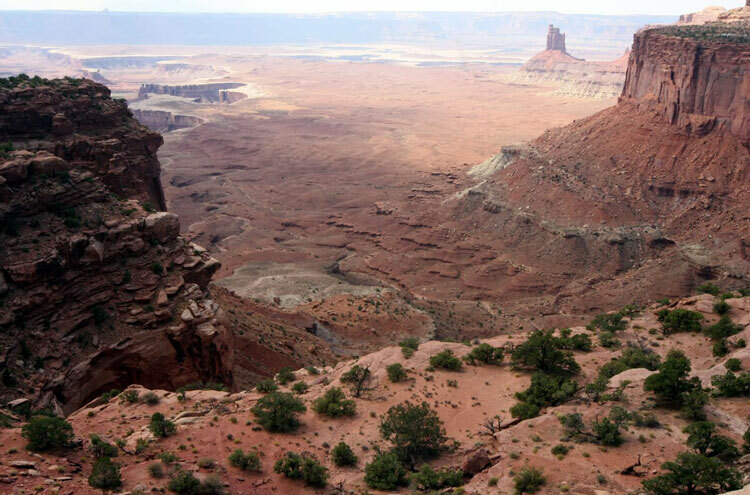 Canyonlands is dry, rocky desert, with hardy, adapted vegetation and wildlife. But both are varied and interesting, although much of the wildlife is nocturnal. Wildlife includes big horn sheep, mule deer, mountain lions, bobcats, coyotes, eagles, hawks and falcons. 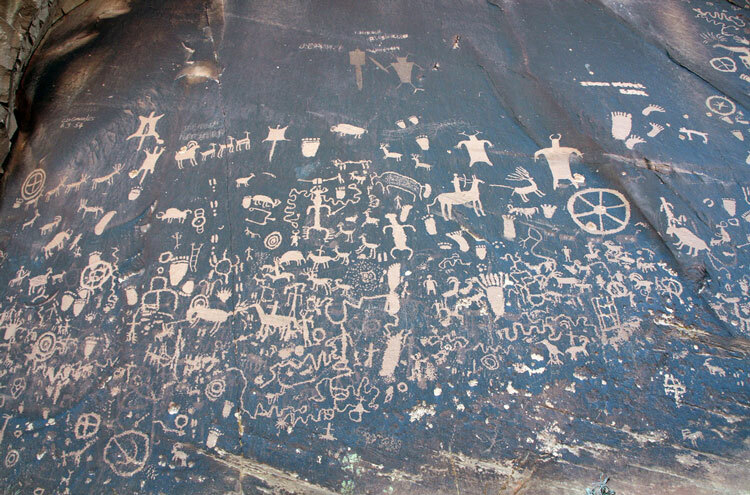 The area has long been occupied, with ruins and petroglyphs remaining as silent evidence. 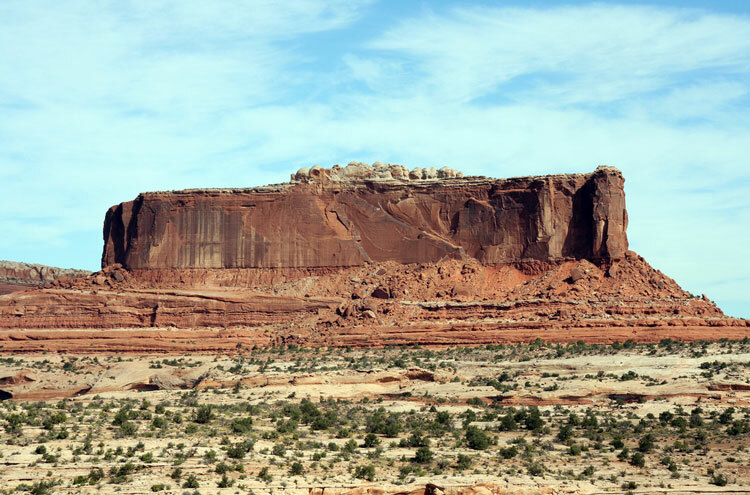 This huge mesa at the heart of the park plays host to some outstanding and famous scenery – and to some fine if relatively short walks: its glory is its rim: dare one say, its interior is not specially thrilling, so longer walks tend to involve descending to the lower levels. Mesa Arch: a half-mile loop to this fine cliff-edge arch on the east side. You are unlikely to be alone. Almost too short to count as a walk. White Rim Overlook: 1.8 mile there-and-back to a fine point on the eastern cliffs. Ridiculously gorgeous views. 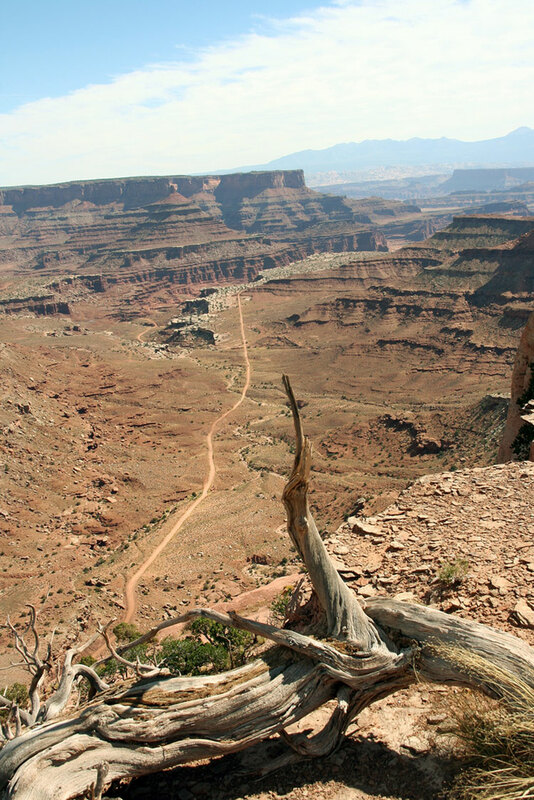 From just by the roadhead, the Gooseberry Trail descends very steeply to the White Rim – 5.4 miles return. Aztec Butte: a steep 2 mile return climb to the remains of ancient Pueblo granaries tucked into rocky niches. Fine views from the top. Murphy Point: a 3.6 mile trail to a superb viewpoint on the western side, and back. Much of the trail is on the nice-enough top of the mesa, with remarkable views opening up as you approach the propontory end. Murphy Loop: walk the 19+km Murphy Trail, down off the Island cliffs, then along the sharp, spectacular Hogback ridge and down to the upper reaches of the White Rim table. Swing south briefly on the White Rim Trail track, then climb back up a wash to the base of the cliffs and on up to the Island. Walkopedia covets this walk. 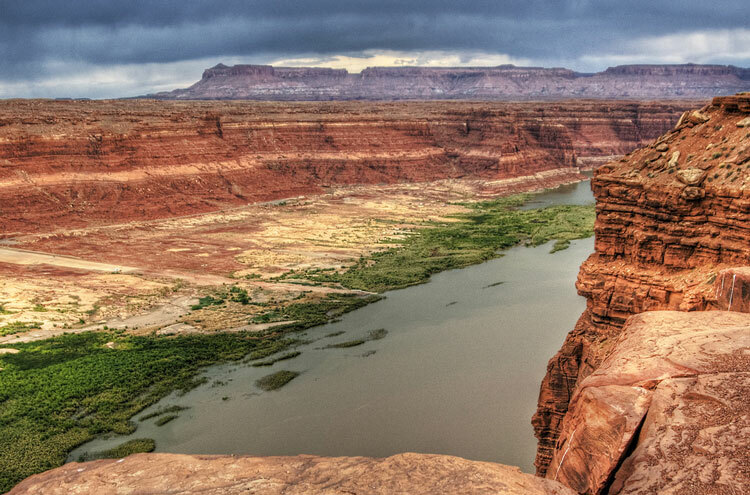 Lathrop Trail, in the north-east: drop from the Island in the Sky to the White Rim (in nearly 7 miles) and on down to the Colorado river (another 3.6). A demanding overnighter if going the whole way down and back. Alcove Spring Trail: a long descent into Taylor Canyon in the far north, to view the stunning Moses and Zeus towers. 11+ miles return. 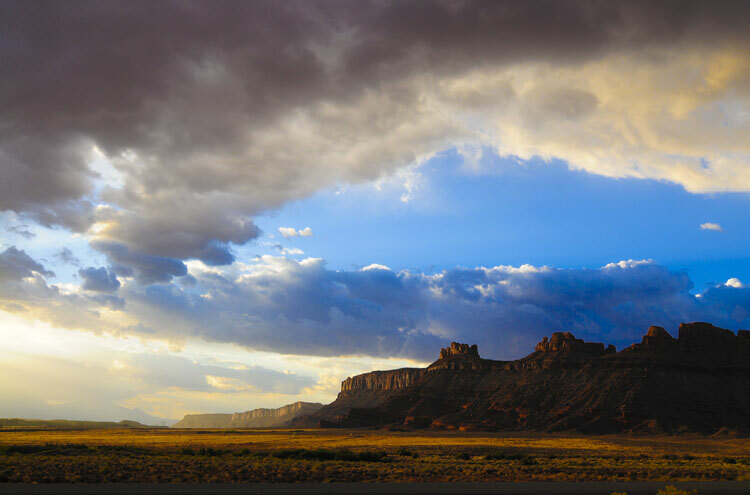 The Upheaval Dome is a very peculiar feature in the north-west of the Island in the Sky. A ring of huge, bright and often sheer sandstone cliffs surrounds a great hole some 5km across, with what looks like a white miniature mountain range, actually underlying shale, at its centre, with spires of what look like vitrified rock or volcanic plug protruding. There are two theories about its formation, that it is either the heavily eroded remains of a meteor impact crater, or an upheaval pushed by the great salt layers that underlie the area. A must is the short walk from the roadhead to the two Upheaval Dome Overlooks perched on the inner ring, which give fascinating views of the heart of the crater. The dramatic bare, smooth sandstone ridge of the Whale is also very worthwhile. The famous walk here is the Syncline Loop, a demanding 13km/8mile circuit which runs between the rocky rings around ther Dome, much of the time in spectacular dry red sandstone canyons. You can also walk in to the weird white centre of the Dome; and out west through the great gap in the cliffs and down the Upheaval Canyon trail to the Green River. 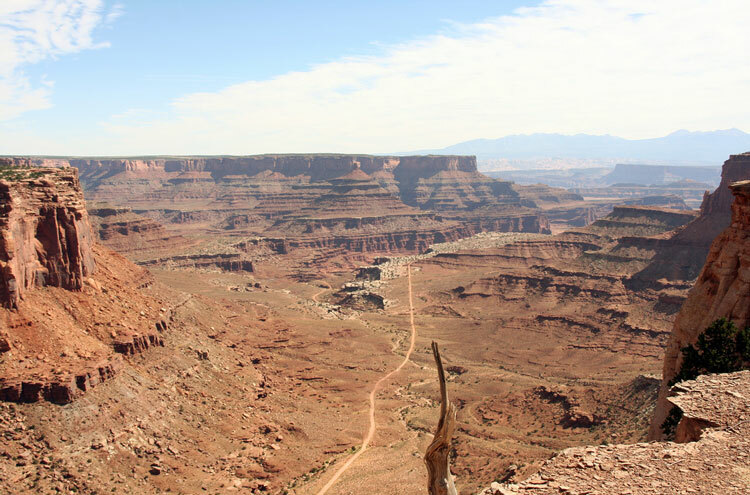 The White Rim Trail/Road is a 4WD track which runs round the entire White Rim plateau, below the Island in the Sky. While it is most popular with off-roaders, it is often beautiful and always interesting walking, as well. Quite a lot of walking options. This big area in the south-west of the park consists at its heart of extraordinary – even weird at times – brightly coloured sandstone towers, spires, needles (even), mushrooms, cliffs and walls and arches laced with canyons big and small and scrubby pockets. The Needles have been shaped by the erosion of a multitude of vertical fractures. Around the core of “needles” are eroded slickrock and shallow canyons. The whole area is a bit of a maze. Access is by a long road in from the east. 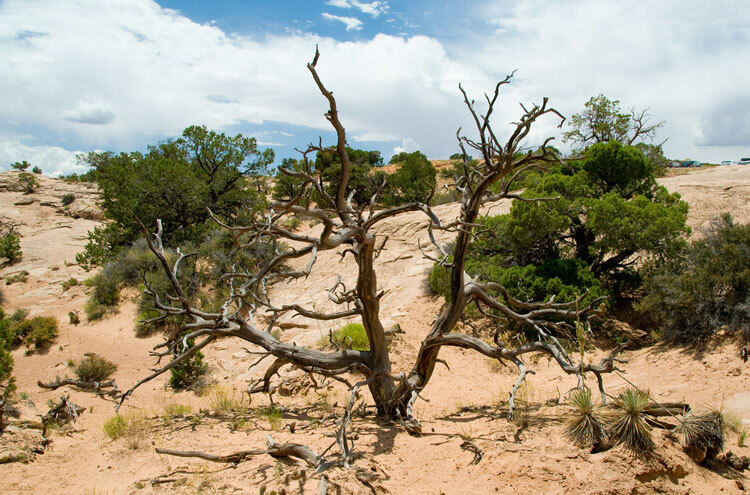 In the south-west is the peculiar area of dry grassland surrounded by extraordinary needly formations known as Chesler Park; many would argue this is the area’s finest walking, but it takes some getting to. There is consensus that the best walk is the Chesler Park Loop/Joint Trail, a 11 mile (18km) circuit of Chesler Park from/to Elephant Hill (6miles appx if already in Chesler Park), which gets to admire the local rocky peculiarities. The dramatic Joint Trail section creeps through very narrow, deep gaps in the formations. A walk further out from Chesler Park to the elevated Druid Arch to the south (11 miles or so return from Elephant Hill). Big Spring Canyon to Squaw Canyon, a magnificent 7.5 mile loop from Squaw Flat. Big Spring Canyon to Elephant Canyon, demanding, but remarkable views of canyons and formations, from slickrock and mesa tops. Squaw Canyon to Lost Canyon, an at times demanding but superb 9 mile loop. 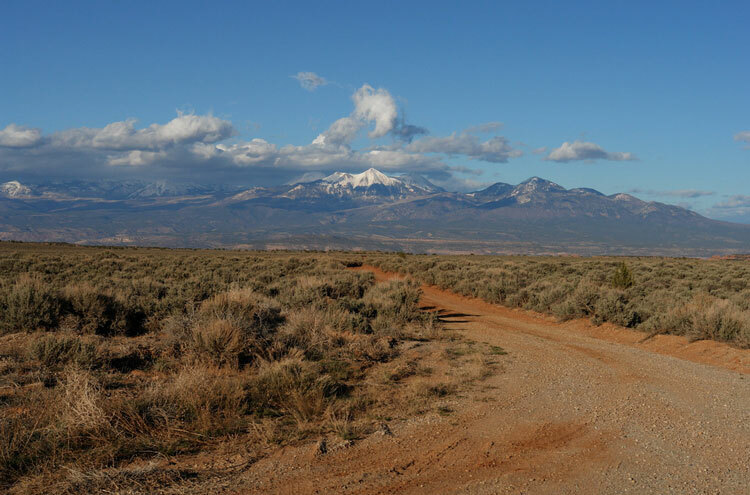 The Confluence Outlook Trail runs west from the northern roadhead, across open country to a superb high lookout over the… er…confluence of the Colorado and Green rivers. The Slickrock Trail meanders for 4 km or so through the rough bare rock of the north of the area, a very atmospheric trail with fine views over the Big Spring and Little Spring canyons. Gorgeous Salt Creek Canyon to the south-east passes through fabulous scenery, including a diversion to the famous Angel Arch, and takes in old Indian ruins and rock art. The Peekaboo Trail is a demanding 10 mile there-and-back from Squaw Flats with 2 ladders to climb, superb views and thrilling landscape. This is true wilderness, a fascinating, tough, confusing and complex area, very remote and thus very pristine. It requires 4WD access and some days. Unsurprisingly, there are numerous thrilling slot canyons to explore. Blue John Canyon is the famous one, as a result of the film 127 Hours, about a scrambler who had to cut off his own arm with a penknife after it got trapped under a boulder. Blue John is in the ultra-remote Horseshoe Canyon area in the far North-east. Rapelling needed, so a technical expedition. This can be tough walking in hot, dry conditions. Come fully prepared, including carrying plenty of water. 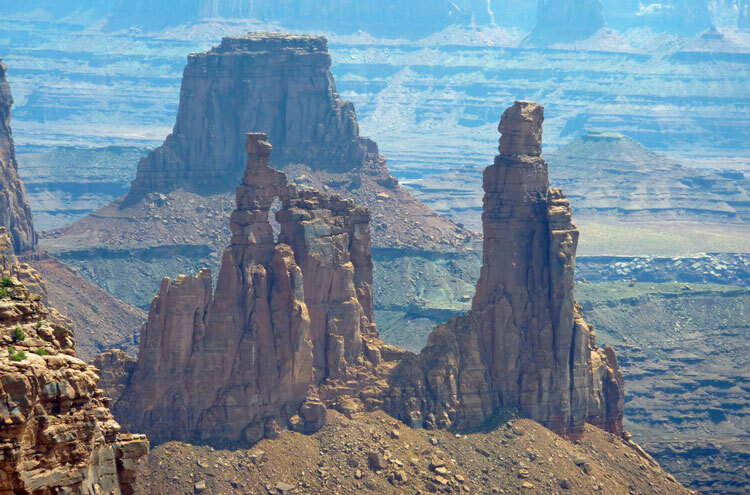 The book is Canyonlands and Arches National Parks by Bill Schneider for Falcon Hiking Guides. Find relevant books on Amazon.